The Cup of Cocoa C2C Graph will make a beautiful washcloth or Potholder Holder to brighten up your kitchen. I have been speaking to a lot of crocheters that want to learn Corner to Corner crochet graphs, but could not find any easy small graphs to try first. To help meet their needed I decided to make a series of C2C graphs that could be used as either pot holder of washcloths. I will be releasing a new graph every month in 2019. If you do not know the Corner to Corner crochet stitch you can learn it in my Corner to Corner for Beginners. I use photo and video tutorials to walk you through the process. If you love this graph and don’t want to miss the others, sign up for my newsletter to be notified of any new patterns. In order to make the Cup of Cocoa graph really beginner friendly, I have included a PDF Graph that you can print. Also below you will find the written graph available, as well as a chart that shows you how many color bobbins I used for each color and where I carried my yarn. I have also included two sizes of the graph, a 13×13 graph with the written chart and a 15×15 graph. All the other graphs in the series will be 15×15 graphs. Of course Corner to Corner crochet is not the only way you can use the Cup of Cocoa C2C Graph. You could make the graph using the bobble stitch method or with single crochet tapestry crochet. Since this was a smaller graph I thought I would share how I carried my yarn. I like to use my Printable Bobbins to keep my yarn from getting tangled. For this graph I used 3 blue bobbins, 2 red bobbins and 1 white bobbin. You can of course carry the yarn how every you like but this is just how I did it. I was not able to carry the white yarn. Below I map out using different where I carried each bobbin using different colors. For the washcloth I added the border and wove in my ends and it was done. For the Pot Holder, I made a plain 13×13 C2C square (or 15×15), Single Crocheted a border to that square and the square using the graph and used a running stitch to sew the two together. You can learn more about Sewing Crochet Pieces Together with my video tutorial. 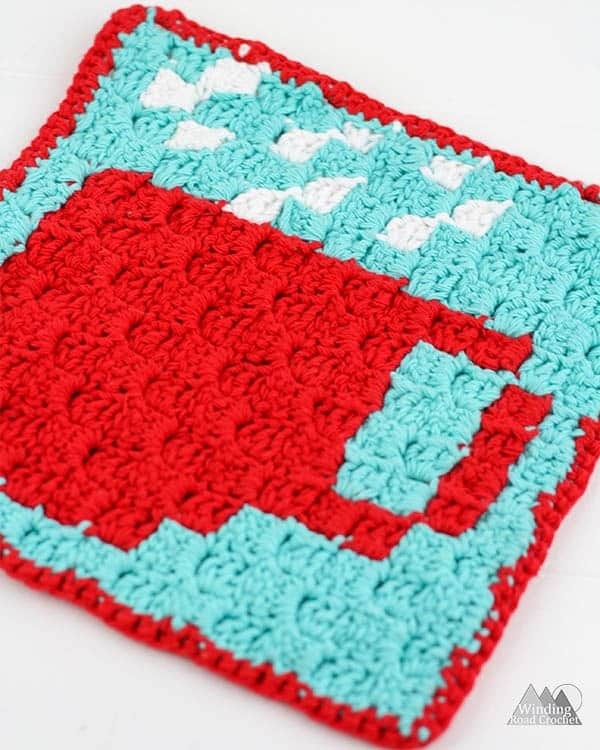 Are you going to make a Cup of Cocoa C2C Graph Potholder? I would really like to see your finished piece, take a picture and share it with me on any social media! Just tag me @windingroadcrochet, #windingroadcrochet, or #ourcrochetjourney. Join my Facebook Group and share your creation with the community at Our Crochet Journey Facebook Group! Written pattern, tutorials, graphs and pdfs of the Cup of Cocoa C2C Graph are copyright Windingroadcrochet.com. Please do not reprint or repost this content as your own, but please feel free to share this link with others. You can find more information on sharing my work with others in the Terms and Conditions Page. I lurve this, tea is my thing and I’ve never actually tried a graph C2C which is weird because I love C2C ao this is a perfect learning projects. Thanks.